Children were born to be active. As soon as they are out of the womb, children have the strong desire to crawl, walk and run through life. Unfortunately, however, this strong desire is starting to diminish at alarming rates as children get older and technology gets more advanced. With the hustle and bustle of society and everyday lives, parents may find it hard to be physically active themself. However, this is just another excuse to not exercise, and one your child will mimic. Children need a role model in their life show them what is right and what is wrong, and what is healthy and what is not. Parents should start teaching children about physical activity even before children enter preschool. For over 20 years now, childhood obesity in the United States has been growing at a rapid rate. Primrose Schools suggests poor diet and lack of physical activity are the cause of this. Often time’s parents will “bribe” children, or urge them to do something, by using fast food and sweets. This type of food however, lacks nutritional content and will make children less likely to engage in activity for the body. There is an increasing level of childhood obesity in the United States that has been going on for the past 20 years. This is because of a lack of physical activity as well as a poor diet. Parents often use fast food and sweets as a way to motivate their children, however this type of food only helps a child to become more sluggish and they lose the desire to be physically active. According to researchers, not only will physical activity begin to teach children how to live a healthy lifestyle, but it will also help youngsters refine and practice their basic motor skills. These basic motor skills will help your child’s performance in the classroom. Research suggests that physical activity is linked to academic development. Incorporating physical activity into your family’s everyday schedule may seem difficult at first, but if you get the whole family involved it can be a fun way to spend quality time together while improving everyone’s health care. Have different size toy balls around the house that are easily accessible to children. Make sure they are age appropriate as well, a young child shouldn’t be playing with a hard baseball. Use sidewalk chalk to draw hopscotch grids. Blow bubbles and take turns catching them. Get a trampoline (if children are old enough) and put it in the backyard so you can each take a turn jumping around. Play music and dance to the beats. Utilize parks that have playgrounds or athletic fields. 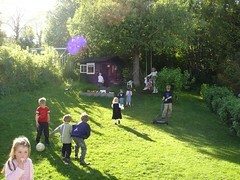 Create the “Olympic Games” for all of the neighborhood children to take part in. Sign up for the YMCA. This will allow you to keep active throughout the whole year. Not only are these simple ideas, but they can easily modified or made more challenging depending on the needs of the children. Also, they are easy ways for you to be active with your child as well. When given a role model, children are much more likely to lead a life of healthy habits. The only way to reverse this trend is to get up, get moving and get involved. Families must stay active to avoid becoming a statistic. The power is completely in your hands so grab a ball, a bike or a stick of chalk and head outdoors. Submitted by Dan Gilbert on behalf of Primrose Schools. For over 25 years, Primrose has helped students achieve higher levels of success by providing them with AdvancED® accredited, education and early child care services. Through an accelerated Balanced Learning® curriculum, Primrose Schools students are exposed to a widely diverse range of subject matter giving them a much greater opportunity to develop mentally, physically and socially. Dan has written a number of articles on topics varying from bilingual learning to teaching the importance of volunteering.